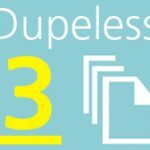 “Dupeless 3” is the new version of a small program for getting rid of duplicate files. It’s $8 from PC Magazine’s Utility Library or free for members who pay $20 for a year’s worth of programs. We paid. Dupeless 3 removes the duplicates and you have some control over the situation. You can search by file name, content, or both. You can limit the types of files, such as photos or documents. Restricting the search is a good idea, otherwise the program shows you too many files that are part of the operating system. Other programs we’ve used and liked from this source include VisiPics, a free program which found thousands of image duplicates and freed up several gigabytes of storage on Joy’s computer. As it finds duplicates, VisiPics displays thumbnails of each one in a string of images to the left of the screen. It also lists their file size. File size is a crucial clue to the picture’s resolution: the bigger the file ,the higher the resolution. Click on any image to delete it. Or choose the “auto delete” setting. It will then delete only exact duplicates, deleting pictures with a lower resolution than the original. This is quick and handy. If you have a Mac, Gemini, from download.com, is designed to do the same kind of cleanup.